My little girl is now officially 3 and I think that technically means she is no longer a toddler, but a true little girl. 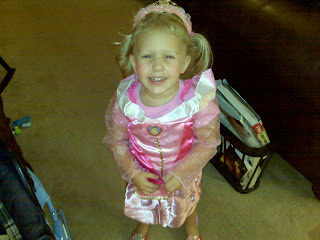 Well I am happy to report that Addison's 3rd birthday party was a utter and complete success! All the kids were so good and the bouncy castle was a huge hit! My sister in law's cake was phenomenal and we had plenty of food. 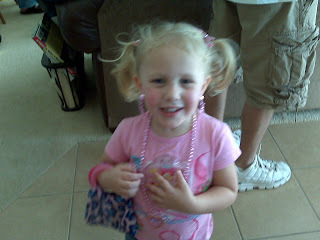 She got tons of dress up clothes, make up and barbies. And she has been in high heels and snap on earrings ever since. It really is cute. She keeps saying to me... "Mommy that was a really good party". I feel vindictated for all the hard work... :) And I even think all the adults had a good time. Yesterday we took the kids to this cornmaze and pumpkin patch in Hondo, Texas and it was a lot of fun and good to be outside and get some good country fresh air. I wish it would have been a little cooler though because the heat brought bees and, as we all know, Adi is terrified of those so that was a little bit of a problem. Afterward we went to this little restaurant named Sammy's in Castroville and had a good meal while discovering that Kirstynn now knows how to drink through a straw!!!! We are in big trouble because there will be no more eating in peace. If she sees the straw - she wants it and definitely knows what it is. I wish she'd get some teeth now. Almost 8 months and still looking like Mr.Burns with no hair and no teeth! I am off today to celebrate Adi's official birthday and Im thinking of just taking her to a little quiet lunch and getting her some of her favorite mac and cheese and coming back to the house to play some candyland and dress up. As I told Thomas... it wont be long before she is telling us she would rather do ANYTHING than hang out with her embarrassing parents- so lets take advantage of the time right now. 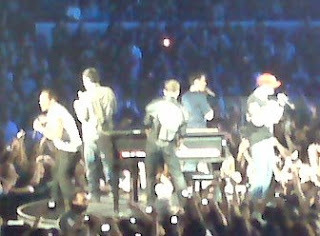 Did I write that I went to the New Kids on the Block concert Friday night? And did I mention that it was completely unreal... I wanted to go for a good time, but it ended up being seriously one of the best concerts of my life. The energy was so high and the guys looked great and sang live and completely in tune!!! As you can see, we got pretty close.